Le Opere, Vol. 1, 149. In Giuliano Pancaldi, Volta: Science and Culture in the Age of Enlightenment (2005), 190. I. Animals have an electricity peculiar to themselves to which the name animal electricity is given. II. The organs in which animal electricity acts above all others, and by which it is distributed throughout the whole body, are the nerves, and the most important organ of secretion is the brain. Thierische Elektricitäund Reizbarkeit. Ein Beytrag zu den neuesten Entdeckungen üdiese Gegenstä(1795), 329. Quoted and trans. in Edwin Clarke and C. D. O'Malley, The Human Brain and Spinal Cord (1968), 180. Ampère was a mathematician of various resources & I think might rather be called excentric [sic] than original. He was as it were always mounted upon a hobby horse of a monstrous character pushing the most remote & distant analogies. This hobby horse was sometimes like that of a child ['s] made of heavy wood, at other times it resembled those [?] shapes [?] used in the theatre [?] & at other times it was like a hypogrif in a pantomime de imagie. He had a sort of faith in animal magnetism & has published some refined & ingenious memoirs to prove the identity of electricity & magnetism but even in these views he is rather as I said before excentric than original. He has always appeared to me to possess a very discursive imagination & but little accuracy of observation or acuteness of research. 'Davy’s Sketches of his Contemporaries', Chymia, 1967, 12, 135-6. Electricity is doing for the distribution of energy what the railroads have done for the distribution of materials. As quoted in 'C.P. Steinmetz Dies In Sudden Relapse', New York Times (27 Oct 1923), 1. Electricity is often called wonderful, beautiful; but it is so only in common with the other forces of nature. The beauty of electricity or of any other force is not that the power is mysterious, and unexpected, touching every sense at unawares in turn, but that it is under law, and that the taught intellect can even govern it largely. The human mind is placed above, and not beneath it, and it is in such a point of view that the mental education afforded by science is rendered super-eminent in dignity, in practical application and utility; for by enabling the mind to apply the natural power through law, it conveys the gifts of God to man. Notes for a Friday Discourse at the Royal Institution (1858). In Napalm and Silly Putty (2002), 170. Faith is like electricity. You can't see it, but you can see its light shining on you. In 'Quotes and Quips', Hinduism Today Magazine (Jan-Mar 2009), web edition. Faraday, … by his untiring faithfulness in keeping his diary, contributes to our understanding the objects of his scientific research in magnetism, electricity and light, but he also makes us understand the scientist himself, as a living subject, the mind in action. In 'The Scientific Grammar of Michael Faraday’s Diaries', Part I, 'The Classic of Science', A Classic and a Founder (1937), collected in Rosenstock-Huessy Papers (1981), Vol. 1, 2. I happen to have discovered a direct relation between magnetism and light, also electricity and light, and the field it opens is so large and I think rich. Letter to Christian Schönbein (13 Nov 1845), The Letters of Faraday and Schoenbein, 1836-1862 (1899), 148. I have been much amused at ye singular φενόμενα [phenomena] resulting from bringing of a needle into contact with a piece of amber or resin fricated on silke clothe. Ye flame putteth me in mind of sheet lightning on a small—how very small—scale. Letter to Dr. Law (15 Dec 1716) as quoted in Norman Lockyer, (ed. ), Nature (25 May 1881), 24, 39. The source refers to it as an unpublished letter. 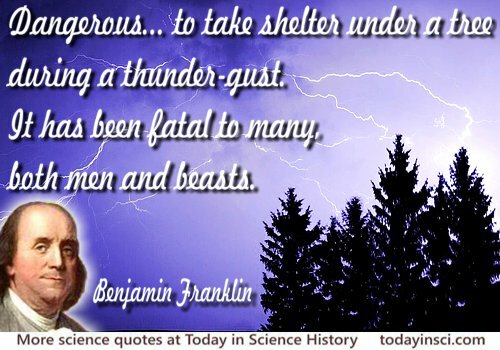 Newton's comment relating the spark of static electricity with lightning long predates the work of Benjamin Franklin. I will set ambitious goals—to see 500 million solar panels installed within four years and enough renewable electricity to power every home in America within 10 years. I've found out so much about electricity that I've reached the point where I understand nothing and can explain nothing. Letter to Réamur (20 Jan 1746), in AS. Proc. verb., LXV (1746), 6. Cited in J. L. Heilbron, Electricity in the 17th and 18th Centuries: a Study of Early Modern Physics (1979), 314. In fact, I’ve come to the conclusion that I never did know anything about it [electricity]. 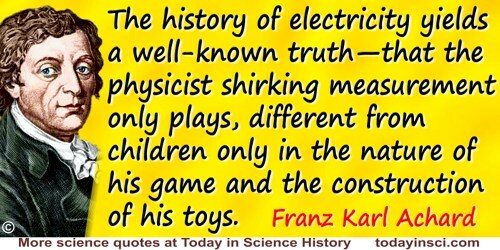 Is it not true that electricity, and all the prodigies it has hitherto discovered, have only served to excite curiosity? It is by no means hopeless to expect to make a machine for really very difficult mathematical problems. But you would have to proceed step-by-step. 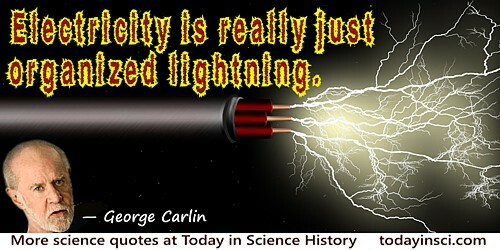 I think electricity would be the best thing to rely on. In Charles Sanders Peirce, Max Harold Fisch, Christian J. W. Kloesel Writings of Charles S. Peirce: 1884-1886 (1993), 422. More than ever before in the history of science and invention, it is safe now to say what is possible and what is impossible. No one would claim for a moment that during the next five hundred years the accumulated stock of knowledge of geography will increase as it has during the last five hundred In the same way it may safely be affirmed that in electricity the past hundred years is not likely to be duplicated in the next, at least as to great, original, and far-reaching discoveries, or novel and almost revolutionary applications. In A Century of Electricity (1890), 223. Our confused wish finds expression in the confused question as to the nature of force and electricity. But the answer which we want is not really an answer to this question. It is not by finding out more and fresh relations and connections that it can be answered; but by removing the contradictions existing between those already known, and thus perhaps by reducing their number. When these painful contradictions are removed, the question as to the nature of force will not have been answered; but our minds, no longer vexed, will cease to ask illegitimate questions. Principles of Mechanics (1899), 7-8. 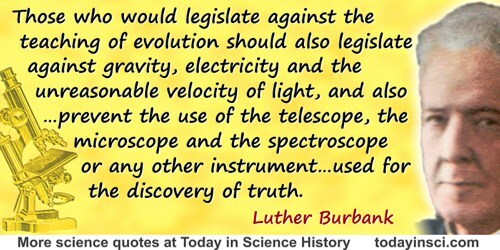 Science and religion no more contradict each other than light and electricity. In Tryon Edwards, C. N. Catrevas, The New Dictionary of Thoughts: a Cyclopedia of Quotations (1891, 1960), 554. The alternating current will kill people, of course. So will gunpowder, and dynamite, and whisky, and lots of other things; but we have a system whereby the deadly electricity of the alternating current can do no harm unless a man is fool enough to swallow a whole dynamo. (1884). As quoted in Francis Ellington Leupp, George Westinghouse: His Life and Achievements (1918), 149. 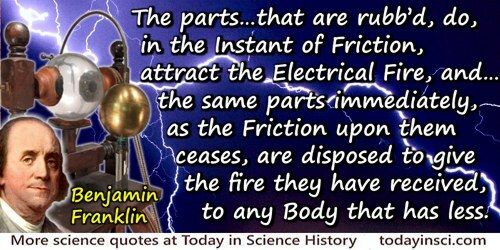 The electric age ... established a global network that has much the character of our central nervous system. Understanding Media: the Extensions of Man? (2nd Ed.,1964), 302. The lessons of science should be experimental also. The sight of a planet through a telescope is worth all the course on astronomy; the shock of the electric spark in the elbow outvalues all theories; the taste of the nitrous oxide, the firing of an artificial volcano, are better than volumes of chemistry. The Prose Works of Ralph Waldo Emerson (1870), 552. 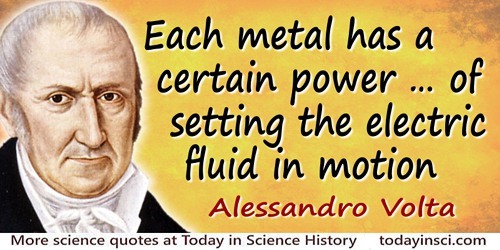 The momentous laws of induction between currents and between currents and magnets were discovered by Michael Faraday in 1831-32. Faraday was asked: “What is the use of this discovery?” He answered: “What is the use of a child—it grows to be a man.” Faraday’s child has grown to be a man and is now the basis of all the modern applications of electricity. In An Introduction to Mathematics (1911), 34-35. The most startling result of Faraday’s Law is perhaps this. If we accept the hypothesis that the elementary substances are composed of atoms, we cannot avoid concluding that electricity also, positive as well as negative, is divided into definite elementary portions, which behave like atoms of electricity. Faraday Lecture (1881). 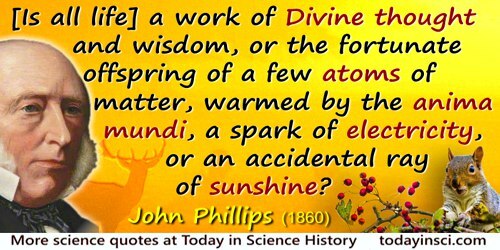 In 'On the Modern Development of Faraday's Conception of Electricity', Journal of the Chemical Society 1881, 39, 290. It is also stated in the book by Laurie M. Brown, Abraham Pais and Brian Pippard, Twentieth Century P, Vol. 1, 52, that this is 'a statement which explains why in subsequent years the quantity e was occasionally referred to in German literature as das Helmholtzsche Elementarquantum'. There is no plea which will justify the use of high-tension and alternating currents, either in a scientific or a commercial sense. They are employed solely to reduce investment in copper wire and real estate. There is nothing wrong with electricity; nothing except that modern man is not a god who holds the thunderbolts but a savage who is struck by lightning. They could have done it better with an axe. (1890) On the first use of the electric chair—the horrendously botched execution of William Kemmler, condemned murderer. As quoted in 'Warden Durston's Record: The Man Who Botched the Kemmler Execution', New York Times (18 Aug 1890), 5. They may say what they like; everything is organized matter. The tree is the first link of the chain; man is the last. Men are young; the earth is old. Vegetable and animal chemistry are still in their infancy. Electricity, galvanism,—what discoveries in a few years! Watson, if I can get a mechanism which will make a current of electricity vary in its intensity, as the air varies in density when a sound is passing through it, I can telegraph any sound, even the sound of speech. As quoted by Thomas A. Watson, in Exploring Life: The Autobiography of Thomas A. Watson (1926), 62. We don’t understand electricity. We use it. You can plug into it and light up a lamp, keep a heart pump going, light a cathedral, or you can electrocute a person with it. … I think talent is like that. In the safe herbal of the coal? New slaves fulfilled the poet’s dream. Poem, 'Wealth', collected in The Complete Works of Ralph Waldo Emerson: The Conduct of Life (1859), 83-84.
Who would not have been laughed at if he had said in 1800 that metals could be extracted from their ores by electricity or that portraits could be drawn by chemistry. Letter (20 Aug 1847), The Letters of Faraday and Schoenbein, 1836-1862 (1899), footnote, 209. 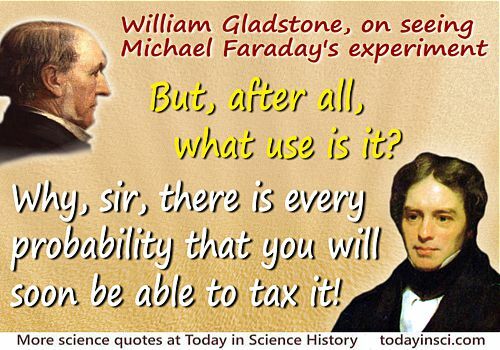 Said to William Gladstone, the Chancellor of the Exchequer, when he asked about the practical worth of electricity. Quoted in R. A. Gregory, Discovery, Or The Spirit and Service of Science (1916), 3.